Thriving business environment, flourishing tech environment and an effective talent pool have made Singapore the premier tech city among its Asia-Pacific (APAC) peers. 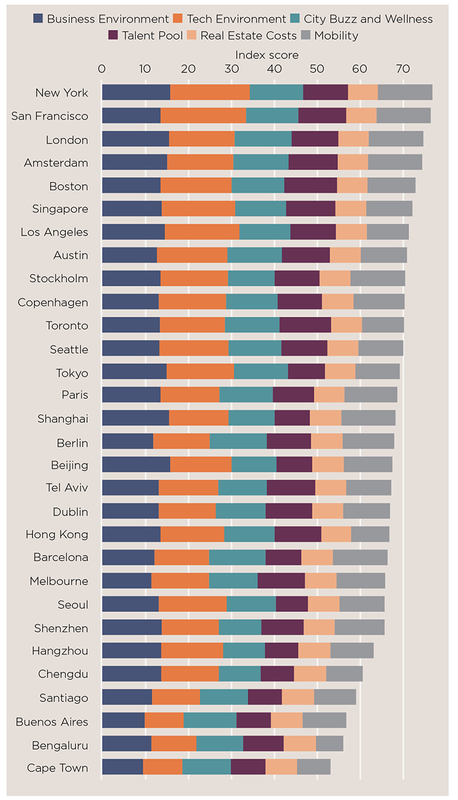 According to the Savills Tech Cities index, which measured 30 cities from across the world against 100 individual metrics, ranging from the volume of inward venture capital investment through to the cost of a flat white coffee, placed the island nation on the sixth spot, behind Amsterdam (fourth) and Boston (fifth). New York took the top spot as the premier tech city in this year’s index, overtaking San Francisco. The report, by London-based real estate company Savills, says access to a deep talent pool and the Big Apple’s reputation as a global centre of commerce makes it the global leader. Small wonder then Amazon recently selected New York’s Long Island City as a location for its second headquarters, citing the ability to attract world-class talent as a key determinator. VC investment volumes have topped those of San Francisco for the last three years, it notes. London rounded off the top three. According to an October report by EY, during the second quarter of 2018 private equity and VC activity in South-east saw US$1.3 billion worth of investments pumped into 36 deals. Singapore contributed to more than half of the aggregated deal value, witnessing 20 deals in Q2 2018 with a total value of US$739 million. The top deal came from the US$312 million privatization of crane supplier Tat Hong Holdings by Standard Chartered Private Equity and chief executive officer Roland Ng's family. A tech city, according to Savills, is an important centre of tech within its region, a major recipient of venture capital (VC) investment, on the shopping list for expanding global tech companies, a vibrant city in which to live and work, and a generator of, and magnet for, talent. It grouped the 100 metrics into six categories: business environment, tech environment, city buzz and wellness, talent pool, real estate costs, and mobility. Each category is weighted to reflect its importance to the tech sector. London’s top spot as the dominant tech hub in Europe was because of its performance on the “buzz and wellness” and mobility sub-metrics. It also received three times more VC investment in 2018 than the nearest European rival for VC investment, Paris. Amsterdam, meanwhile, benefitted from a skilled, English-speaking workforce and good scores across all categories. Savills notes that Chinese tech cities, including Shanghai, Shenzhen and Beijing, have risen fast, and now account for a higher share of VC investment than their US counterparts. Beijing recorded an average $34 billion of VC per annum in the last three years, volumes higher even than New York and San Francisco, it says. “... Shenzhen, an exceptionally youthful tech city, benefits from strengthening links with Hong Kong (just 15 minutes away via high-speed rail) and a new tech-stock exchange, ChiNext. Hangzhou, home to Alibaba, stands out as a lower cost ‘smaller’ city (population 9.5m), famed for its West Lake UNESCO World Heritage site. Chengdu’s tech economy has risen on outsourcing, its government is pro-business and tech investment is rising,” the real estate company says.